Gold, silk and graphite may not be the first materials that come to mind when you think of cutting-edge technology. Put them together, though, and you’ve got the basic components of a new ultrathin, flexible oral sensor that can measure bacteria levels in the mouth. The device, attached temporarily to a tooth, could one day help dentists fine-tune treatments for patients with chronic periodontitis, for example, or even provide a window on a patient’s overall health. The sensor, dubbed a “tooth tattoo,” was developed by the Princeton nanoscientist Michael McAlpine and Tufts bioengineers Fiorenzo Omenetto, David Kaplan and Hu Tao. The team first published its research last spring in the journal Nature Communications. The sensor is relatively simple in its construction, says McAlpine. It’s made up of just three layers: a sheet of thin gold foil electrodes, an atom-thick layer of graphite known as graphene and a layer of specially engineered peptides, chemical structures that “sense” bacteria by binding to parts of their cell membranes. “We created a new type of peptide that can serve as an intermediary between bacteria and the sensor,” says McAlpine. “At one end is a molecule that can bond with the graphene, and at the other is a molecule that bonds with bacteria,” allowing the sensor to register the presence of bacteria, he says. Because the layers of the device are so thin and fragile, they need to be mounted atop a tough but flexible backing in order to transfer them to a tooth. The ideal foundation, McAlpine says, turns out to be silk—a substance with which Kaplan and Omenetto have been working for years. Omenetto, Kaplan and Tao created a thin, water-soluble silk backing for McAlpine’s bacterial sensor—a film that’s strong enough to hold the sensor components in place, but soft and pliable enough to wrap easily around the irregular contours of a tooth. 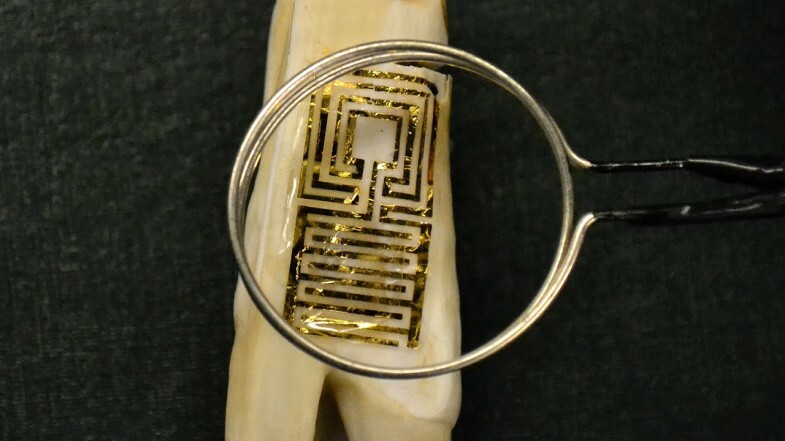 To apply the sensor, McAlpine says, you need only wet the surface of the entire assembly—silk, sensor and all—and then press it onto the tooth. Once there, the silk backing will dissolve within 15 or 20 minutes, leaving behind the sensor, a rectangle of interwoven gold and black electrodes about half the size of a postage stamp and about as thick as a sheet of paper. The advantage of being attached directly to a tooth means that the sensor is in direct contact with bacteria in the mouth—an ideal way to monitor oral health. Because the sensor doesn’t carry any onboard batteries, it must be both read and powered simultaneously through a built-in antenna. Using a custom-made handheld device about the size of a TV remote, McAlpine’s team can “ping” that antenna with radio waves, causing it to resonate electronically and send back information that the device then uses to determine whether bacteria are present. Right now the sensor can detect only gram-negative bacteria, the general class of bacteria responsible for periodontal disease. Once its detection ability is honed, it eventually might help dentists track exactly when and where certain bacteria are present in the mouth so that they can develop customized treatment plans for patients with chronic periodontal disease. “A sensor like this could give you a panoramic view of what’s happening over a number of hours or even days,” says Gerard Kugel, D85, L93, a professor of prosthodontics and operative dentistry and associate dean for research at Tufts School of Dental Medicine. In addition to monitoring oral health, Kugel believes the tooth tattoo might be useful for monitoring a patient’s overall health. Biological markers for many diseases—from stomach ulcers to AIDS—appear in human saliva, he says. So if a sensor could be modified to react to those markers, it potentially could help dentists identify problems early on and refer patients to a physician before a condition becomes serious. “The mouth is a window to the rest of the body,” Kugel says. Article originally appeared in Tufts Dental Medicine Magazine and Tufts Medicine Magazine. Published Winter 2013.